While drunk driving car accidents, including alcohol-related fatal car accidents, are always problems, there are certain times of year when we see perennial increases in drunk driving incidents. There is a noted increase around the holidays between Thanksgiving and New Year’s Day in the fall and winter, along with this time of year, at the end of the summer, when we tend to see a large increase in drunk driving accidents as well. It is for this reason the United States National Highway Traffic Safety Administration (NHTSA) runs its annual “Driver Sober or Get Pulled Over” anti-drunk driving public safety campaign around this time of year. According to a recent news article from the Wall Street Journal, the three-week annual campaign goes from late August through Labor Day. Labor day is one of the times when we typically see big increases in drunk driving arrests and drunk driving car accidents. As our Boston drunk driving accident lawyers have seen all too often, people see Labor Day as the last chance to enjoy summer. Many people in our area will take a trip down to Cape Cod, while others will head north to Cape Ann or to the beaches of New Hampshire. Others will go to visit friends in the greater Boston area to have a cookout. Regardless of whether someone chooses to go to Hyannis Port or to Malden, the common denominators are a lot of alcohol and a lot of driving, and this leads to a lot of drunk driving car accidents, many of which result in serious personal injury or death. Those working on the campaign are constantly trying to find new ways to reach those who regularly drive drunk and get them to change their behavior. This is much more difficult than reaching those who do not regularly drive drunk. The problem is that many frequent drunk drivers are alcoholics, and this is the first thing that must be addressed. As the article notes, there is an old joke frequently told by members of Alcoholics Anonymous that says when an alcoholic gets arrested for drunk driving enough times, it finally sinks in that he or she has to make some life-changing decisions, so they tend to eventually quit driving. However, sociologists see that law enforcement and legislators also try to use their power to stop drunk driving though jail and license suspensions, but they do not do nearly as much to stop problem drinking, despite the fact that many drunk driving accidents are consequences of alcoholism. Since we know that people are willing to disobey the law and drive drunk, it should come as no surprise that many of these same people are just as willing to drive on a suspended or revoked license, since nothing has been done to address the fact defendant is an alcoholic who makes poor choices. One program being used in South Dakota seems to be making an impact. 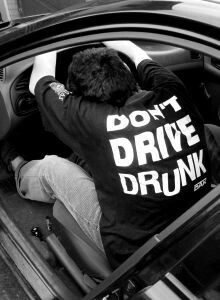 It lets people arrested for drunk driving keep their license with no restrictions other than they may not drink alcohol. Every morning and evening for five months, defendants must to come to a police station and take a breath test. If they are drunk, there is an automatic two-day jail sentence for each violation. There has been a 99 percent success rate for people showing up and passing the tests since 2005.